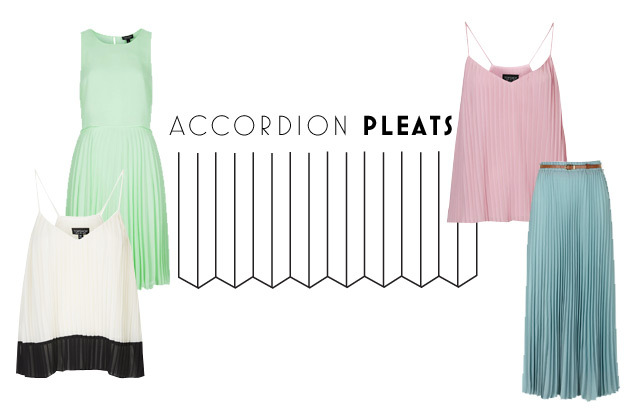 It's time to name those pretty pleats you're eyeing. There are just some sartorial pieces in this world that look better with pleats. But those folds that create so much drama and texture to an otherwise plain midi, mini, or maxi have names, you know. Today we school you on the basic types of gathers you should be familiar with whenever you go shopping. From soft accordion pleats on flowy chiffon, to the edgy tailored box pleats on those trendy skorts, scroll down to see the four classifications before heading to the gallery to shop. Box pleats are those with wide folds usually seen on mini skirts and dresses. They are often applied to thicker fabrics that can hold five to six pleats to create bigger shapes and volume through bulkier presses. The very feminine accordion pleats on the other hand are those seen on softer fabrics. Most of the time, chiffon, silk and other lightweight fabrics that are easy to iron press can accomodate this type of pleat. There is also a sub-kind of the accordion called crystal pleats, which feature even tinier folds often applied on tops. 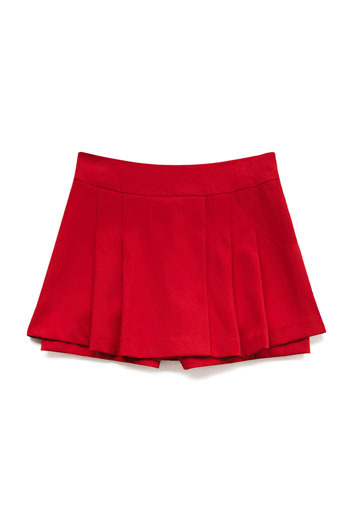 Knife pleats or side pleats are those applied to preppy skirts or skorts. Also seen on cheerleader uniforms, the knife pleats are a type of gather that allows the garment to change its shape with movement. The inverted pleat is similar to the box pleat. The only difference is that the fold is on the inside rather than the outside creating a more subtle but still beautiful effect. This type of drama adds just the right amount of flair to skirts and dresses. 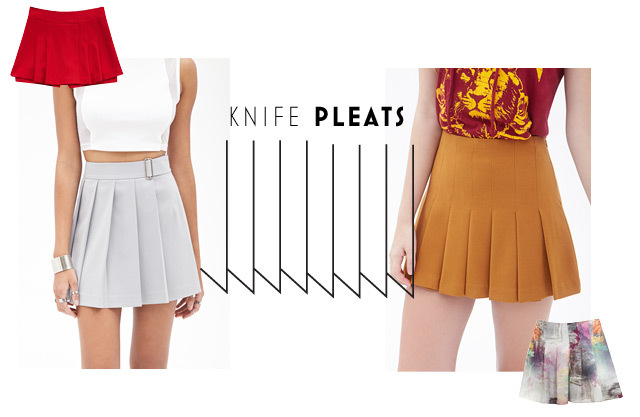 So, which pleat is your favorite? Head on over to the gallery to start shopping! Enjoy!